Professor Ni Qing is the head of the Endocrine Department at the Guangan Men Hospital in Beijing specializing in the treatment of diabetes and related diabetic complications. Professor Ni received his doctoral degree in 2000 from the Chinese Academy of Traditional Chinese Medicine in Beijing. His approach in the management of diabetes is to adopt the traditional Chinese medicine theory of pattern identification in the diagnosis of diabetes and subsequent treatment strategy. He advocates the unique approach by regulating yin and yang to reverse the impaired glucose tolerance of diabetic patients thus preventing the early onset of diabetic microvascular disease. His other clinical forte is to treat hyper- and hypo-thyroidism, thyroiditis, hyeruricemia and gout. He is currently the Executive Director of the National Traditional Chinese Medicine Hospital. 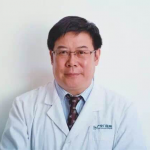 Professor Ni studied under the renowned diabetes specialist Professor Lin Lan and inherited the academic philosophy and clinical approach of Professor Lin. In 2008 Professor Ni was awarded a special prize for conducting the most outstanding post-doctoral training programme for treatment of diabetes. In 2010 he was awarded the “Star of Science and Technology” prize from the Chinese Medicine Society in Beijing for his outstanding contribution for treatment of diabetes.